Anna Hultin is a wife, mama and artist living in Loveland, Colorado. After receiving a BFA in drawing from Colorado State University, she continued to pursue drawing, sculpture, and installation. Since becoming a mama her work has taken on a new, more flexible form: needle and thread. Her embroideries are inspired by her land; from the the vast and rugged landscape of Colorado to the intimacy of her own garden. Check out more of her amazing work on her Etsy, website or Instagram! media audience and then miss out on experimenting and growing my work. So I am always working on balancing how I let it influence me. The biggest place I find my inspiration is from the land I live on in Northern Colorado and in my own back yard. My husband and I decided when we got married to stay where we were from and start a family. As a family we have become dedicated to finding and latching onto our roots and our community. In a world where mobility is so prevalent, we see value in investing in one place and in the land we live on. Part of that investing is finding beauty in the landscape that surrounds us. In my most current work I am stitching every plant growing in our home garden, and I’m learning that there is endless beauty to be found there. because I can go back and look at where it’s come from in past works. I can see more clearly where there was success and failure in every past work which then directs me in my future work. My voice has been informed by the various practical ways that art has had to fit into my life to ensure I keep making it. One of the biggest things I realized after graduating was that if I wanted to continue to make artwork outside of school it was going to have to be sustainable in my everyday life. Meaning, if I wanted to have children, then artwork was going to have to find a way to fit into the rhythm of family life. When I became a mama, it became apparent to me that I needed a break from the gallery scene. I decided to learn a simple craft so I could keep creating without the pressure of fitting into the art world. So I picked up embroidery and quickly became addicted. It is the perfect medium for a mom because it can be stored easily and it doesn’t involve a lot of equipment and space to create. Another part of keeping my work sustainable is that it has to fulfill some purpose to me personally. While one ultimate goal is selling work, the other is making work that stimulates me mentally. That is how I arrived at my current garden series and my past native plant and tree series. I want to know more about the plants growing in my yard and in my state, and I find that by drawing them with thread I gain an intimacy to that plant that makes me appreciate everyday beauty in new and invigorating ways. So far I’ve been lucky in that I haven’t come across anyone infringing on my work. If (or when) I do come across it, I would be so disappointed and would certainly address whomever is doing it and ask that they make it right by crediting me. bridge the gap between my new and old work. Once again here is where patience comes in. I know that someday the two will be bridged but right now I need to just continue with the work in front of me. Yes! I draw constant inspiration from @treeoflifelandscaping. They are a local landscaping company that has really informative and beautiful posts about my local landscape. 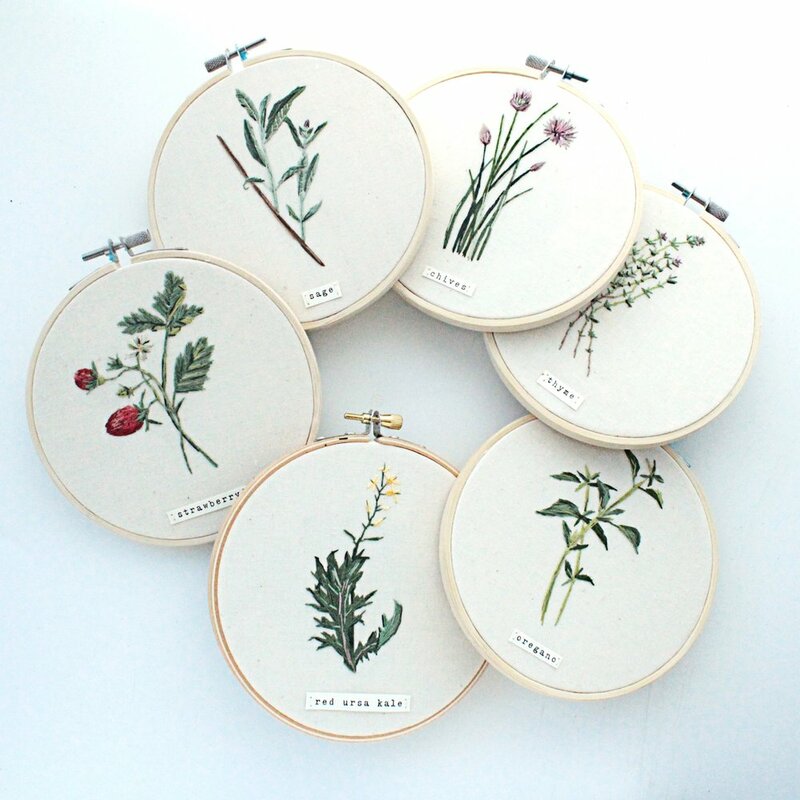 I also love the work of @lyndsey_mcdougall and find her embroidery so beautiful. I am constantly inspired by @leenowelllwilson who is also a mom and an artist, and she bridges the two vocations beautifully. I love the ceramic work of @jennavandenbrink. One last one is @drew_austin4567. His drawings are just amazing, and I can’t get enough of his feed.